The final frontier is rapidly becoming a junkyard. Decades of satellite launches and space missions have left the Earth’s orbit filled with pieces of junk such as fuel tanks, lost tools and parts of derelict satellites. It has gotten so bad that space junk has become such a concern for NASA, they are now looking at a laser system that would ‘displace’ space junk in order to avoid hazardous collisions. 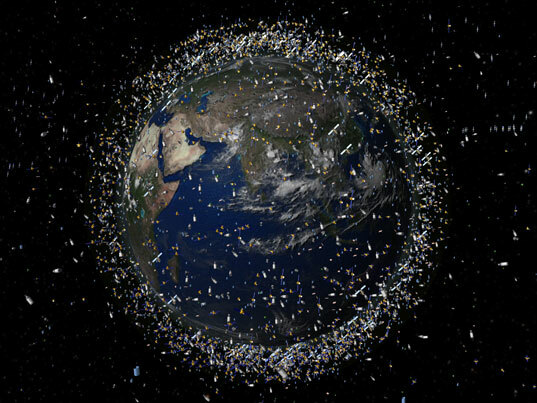 The space junk problem escalated in January 2009 when a collision between the Iridium 33 and Cosmos 2251 satellites created a massive ‘junk cascade’. Moreover the situation was not helped two years earlier, when the Chinese military blew up one of their derelict satellites using a new weapon system. So what are the dangers of space junk? Well, a piece of metal a mere 1cm in size can hit with the impact on a .22 bullet in orbit. A piece of junk the size of a tennis ball can hit a space shuttle with the devastation of 25 sticks of dynamite. Currently, there are over one million pieces of junk between 1cm and 10cm in size, not to mention 5,200 derelict satellites. So what is NASA proposing? 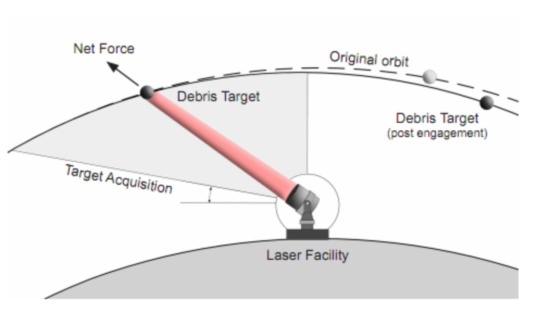 James Mason at NASA Ames Research Center near Palo Alto has theorised that a 5kw ground-based laser could be used to ‘zap’ space junk and displace it so it would not cause any more collisions. By constantly zapping the pieces of junk, they would eventually slow down enough so that they would ‘de-orbit’ themselves. So why not use a much more powerful laser to disintegrate the junk entirely? Well, the US Air Force studied this in the 1990s, but the issue of having such a weapon caused other space faring nations concern, especially with UN laws forbidding the weaponization of space. Mason’s idea would ‘only’ cost a million dollars, and would be able to deal with ten objects a day. Still, it’s cheaper and more practical than some of the more crazy clean-up ideas out there. To see an amazing infographic on the dangers of space junk, click here. The final frontier is rapidly becoming a junkyard. Decades of satellite launches and space missions have left the Earth's orbit filled with pieces of junk such as fuel tanks, lost tools and parts of derelict satellites. It has gotten so bad that space junk has become such a concern for NASA, they are now looking at a laser system that would 'displace' space junk in order to avoid hazardous collisions.